BIG Big Finish Week: Bernice Summerfield THE ORACLE OF DELPHI Review | Warped Factor - Words in the Key of Geek. In the company of Bernice Summerfield and her erstwhile husband Jason Kane, we take a time trip to Ancient Greece. 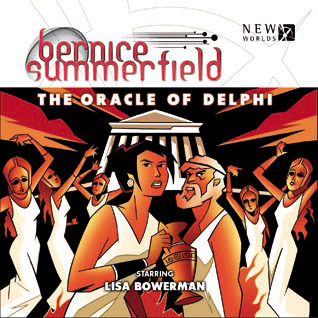 Benny and Jason are seeking the Oracle of Delphi in search of an answer to a burning question (part of the overall Benny arc at this time in the series when released in late 2006). The Oracle is missing and Jason is kidnapped by a strange woman, Megaira. Benny tracks them to Athens and meets up with Socrates. Benny realises a plague is on the way and eventually finds Jason. Exposing Megaira as the Oracle and finding the answer to their question, Benny and Jason return to their own time. The Oracle of Delphi is a very different beast from Walking to Babylon. Babylon is quite serious and sensible compared to the bawdiness, comedy and frivolity of Delphi. Jason and Megaira get naked, both Socrates and Benny drag up, and there is a fair amount of farce when they infiltrate both the Assembly and Megaira's cult. Where the characters of Babylon spoke in the cod-ancient civilisation dialogue, the characters of Delphi are far more modernised - in particular Benny's temporary companion, Socrates. He banters with Benny throughout the story, even uttering swear words and distinctly un-Athenian turns of phrase. The script is vague about how Benny is speaking Ancient Greek, implying she is actually speaking the lingo and suggesting by association that Socrates is also speaking Ancient Greek and what we are hearing is the 'English translation'. In contrast, the character of Megaira upholds the cod-ancient speech tradition, although this is seemingly because she is the villain of the piece. In contrast to this comedic edge, though, we do have the terror of the plague convincingly played out and represented by some gruesome images such as the dog which has been forced to feed on it's dead owner. Historically speaking, we have the eponymous Oracle, Athens, mention of Sparta, a marriage between an Athenian and a Spartan, twin sons (very Romulus and Remus), the plains of Attaca and the Athenian assembly and a lot of discussion of the division of roles between men and women. I'm assuming the plague is also historically accurate as Benny makes a lot of noise about having to let it run its course due to it being an historical fact. The presence of Socrates is a good example of a historical figure featuring in an adventure which in a way works similarly to the celebrity historicals seen in the new series of Doctor Who; particularly Dickens and Shakespeare, with his very modern take on the events unfolding around him. The Oracle of Delphi is a fun story, which for casual listeners possibly suffers from feeling a bit too much like a part of a larger whole, although this was very much the direction the Bernice adventures were moving at this time in the range.